Early Bird Deadline - Register by 12/4! 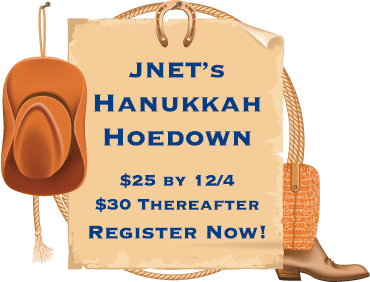 Grab a 'pardner' and doesy-doe down to JNET's Hanukkah Hoedown for an evening of festivities among great friends in a casual country theme. Enjoy dinner, music, dancing, and great raffle prizes! So pull on your boots, git your hat, work up an appetite, and prepare for a rootin' tootin' time! Tickets: $25 when you register by 12/4, $30 thereafter. Contact David Becker, David@davidbeckerhomes.com, to donate a raffle gift. Gain great exposure for your business while sharing in the season of giving. Contact Sandy Hollander, sandy@letsgotrvl.net, with questions. Register NOW before the early bird deadline! JNET's BIGGEST Event of the Year! "Strike" up the fun and great conversation! 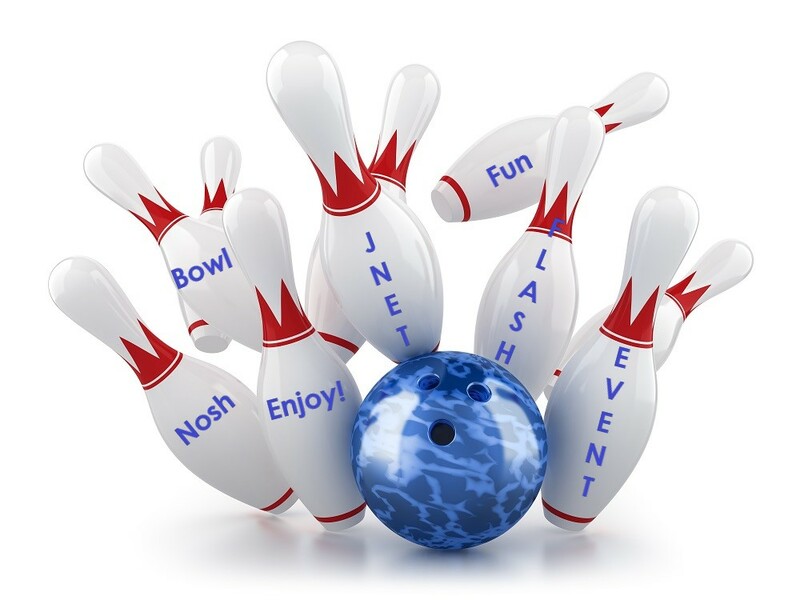 On Sunday, October 15, join fellow JNET'ers for a terrific evening of bowling, schmoozing and, if you don't bowl, cheering on your favorite JNET "team" players! "Strike" up the points and great conversation at JNET's Bowling Night! Join in the camaraderie and games, and bowl to your heart's content. Even if you don't bowl, stop by, schmooze, and cheer on your favorite team. There's something for everyone. Bring family and friends. Enjoy a light dinner, with pizza, salad & drinks. Join us on Sunday, October 15 from 6:00-8:30 PM at Corbin Bowl in Tarzana. Cost is $27 per person, payable in advance. RSVP and pay now. The $27 registration fee covers shoe rental, two hours of bowling, and light dinner that will include pizza, salads, chips & salsa, and soft drinks. A full bar is also available for purchase of alcoholic beverages. A special thank you to the Social Committee, lead by Sandy Hollander, for their efforts in organizing this wonderful event. For more information, email Sandy Hollander at sandy@letsgotravel.net. 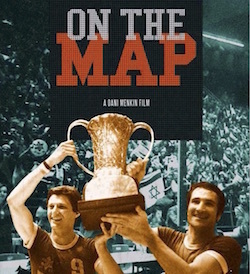 On Sunday, May 7th, following the Celebrate Israel Festival, drive to nearby Sinai Temple for a special screening of On the Map, with dinner and the rare opportunity to meet renowned Israeli Academy Award Winning director Dani Menkin. Don't miss this incredible event co-hosted by JNET and Sinai Temple. After an afternoon on your feet at the Celebrate Israel Festival, cap off the day of festivities at Sinai Temple, where you can sit back, enjoy a catered buffet, and be inspired by a special screening of On the Map, a Dani Menkin film. This powerful film recounts the 1977 European (Basketball) Championship won by underdog Maccabi Tel Aviv. Combining the pulse-pounding action of a high-stakes thriller with an incendiary political background, On the Map tells the against-all-odds story of Maccabi Tel Aviv's heroism battling the traditional European powers. Moments after this highly charged and historic win, Israeli-American basketball hero, Tal Brody, became an indelible part of a young country's history when he said, "Israel is On the Map, not just in sport, but in everything." Witness the spirit of Israel through the nonstop drama and excitement, and commentary and interviews with basketball icon Bill Walton and former NBA Commissioner David Stern. Meet On the Map Director Dani Menkin prior to the film, which has a running time of one hour and 25 minutes. A 30-minute Q & A period with Menkin will follow the screening. Buy tickets in advance! Cost for the film and dinner is $25 for adults, and $20 for guests under 18 years of age. Purchase tickets in advance for our catering count. Tickets at the door will be $30. Checks payable to JNET or cash, which is preferred, will be accepted at the event. Buy tickets now! Click the "Register to Attend" button. "Inspiring," "Priceless information," "Amit’s presentation knocked it out of the ballpark" and "Great networking!" 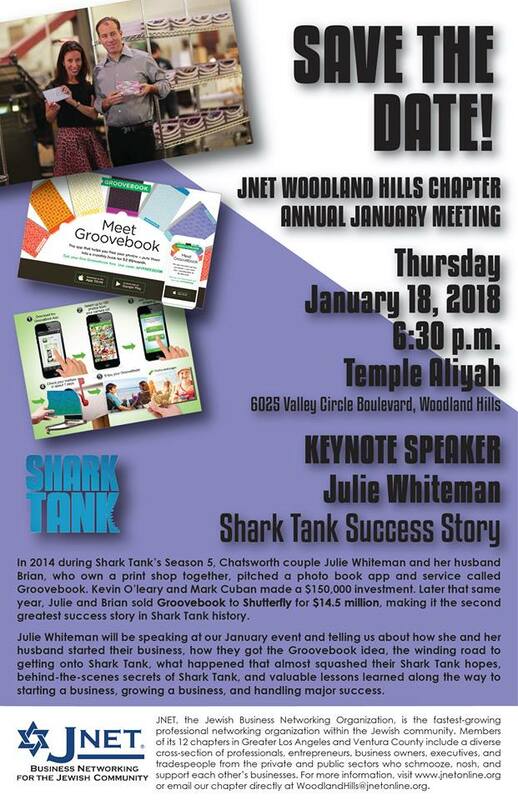 These are just a few of the comments heard at the JNET Woodland Hills annual event, held January 24 at Temple Aliyah. The event drew more than 250 attendees, the largest crowd yet. Menchie’s Frozen Yogurt CEO Amit Kleinberger was the keynote speaker. His talk, “Think Differently,” highlighted how the companies that have succeeded all have one thing in common: They understand the importance of sharing their passion with their customers, and of bringing the customers into the mix. JNET Woodland Hills Chapter President Lisa Aminnia (right) presents Menchie’s CEO Amit Kleinberger with a Certificate of Appreciation for being the event's Keynote Speaker. The event also featured more than 20 JNET businesses with table top displays in the Marketplace. Attendees were greeted by an abundance of food, and the dessert featured Menchie’s frozen yogurt with a choice of toppings. Thank you again to all the event sponsors and to the Marketplace Platinum Sponsors: Douglas Wolf, Family Law Attorney, Jackson Schwartz & Ben Tadelis, Morgan Stanley; Jackie Mendelson, ArabicaDabra Coffee Company; David Shannon, Family & Cosmetic Dentistry; Fred Gruber, First Rate Financial Group; Cara Lisco, Highland Hall Waldorf School; Joel Goldman, ComForCare Home Care; Deborah Shapiro, Alpha Omega Professionals; Sandy Rosenholz, Senior Resources; George Schaffer, Real Estate Professional, Berkshire Hathaway; and Kathleen Goldner, Shalev Senior Living. Kudos to the entire Woodland Hills Chapter Leadership Team. Well done! Woodland Hills Team with Menchie’s CEO Amit Kleinberger. L to R (back row): Michael Sholklapper, Mark Widawer, David Shannon, Amit Kleinberger, George Schaffer, David Becker, Jackson Schwartz and Doug Wolf. JNET Woodland Hills Chapter President Lisa Aminnia (left), Sandy Hollander (right), and Randy Michel (not pictured). Highlights from Hanukkah Night Fever! 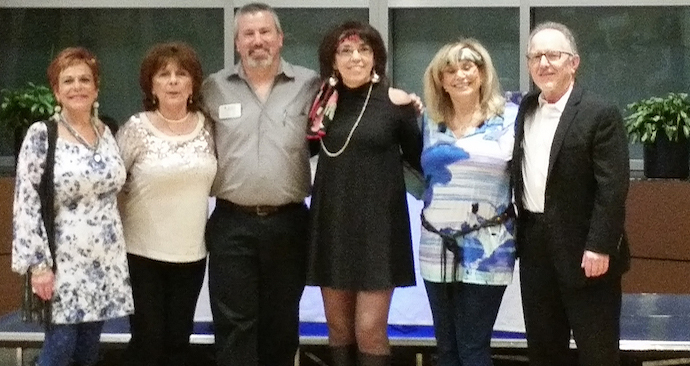 More than 130 JNET members boogied the night away at our "Hanukkah Night Fever" Winter Mixer, held on December 20 at Temple Judea in Tarzana. JNET member Betsy Schmittke and her mentor/partner Rafael Galante surprised the crowd with two beautiful and sultry tango dances. Members donated over 30 raffle prizes, including gift cards, baskets, services and more. For the first time, JNET also held a 50/50 opportunity drawing, which helped raise extra money for the organization. Randy Michel was the lucky winner of half the prize money. Many thanks to all those who contributed to the event, especially the Social Committee. Special thanks to Social Committee Chair Sandy Hollander, David Becker, who led the raffle collection and setup, and Judy Robitschek, who designed the flyer. Continue to check back here for updates on upcoming JNET events. Have photos or video of JNET events you'd like to share? Please email them to info@jnetonline.org with a brief event description.